GraceConnect » Where in the World Are You Going? 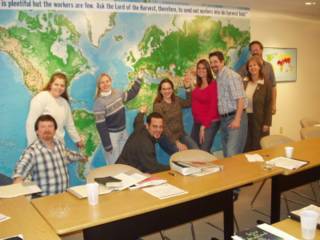 Nine new term missionary candidates are involved in a week-long core training on GBIM’s vision and values at the Grace Brethren International Missions headquarters in Winona Lake, IN, this week. All have been approved for service and will now be raising support for their ministries in France, Argentina, Cambodia, Chad, and southeast Asia. Candidates include Melody Brickel from Basore Road GBC in Dayton, OH; John and Charlene Heydorn from Christ’s Church of the Valley in San Dimas, CA; Kevin and Holly High from Manheim, PA, GBC; Kevin and Jill Kane from the Wooster, OH, GBC; and Bob Steiger from the Centerville, OH, GBC. An additional nine new candidates will go through the training this coming June.